My friend and co-blogger for The Jewish Week, Julie Wiener, writes about Ben Stiller's opening monologue on Saturday Night Live this past week. Julie's "In the Mix" blog focuses on issues facing the intermarried. I also tuned in to Saturday Night Live following a 25-hour fast and then watching my Detroit Tigers lose in their first game of the ALCS to the Texas Rangers. I thought it was funny that Ben Stiller opened his monologue with a Yom Kippur reference and stated that "My father's Jewish, my mother’s Irish-Catholic, which means according to the Torah I’m not actually Jewish, but according to all mirrors I am." Julie used Ben Stiller's line to argue that not all Jews would interpret the Torah as saying that he's not Jewish. She's correct that Reform, Reconstructionist, and -- based on a recent survey -- many Conservative Jews believe that one parent is enough for Jewish status. However, Ben Stiller's mother, Anne Meara, actually converted to Judaism before giving birth to Ben. That means that Ben would be considered fully Jewish. 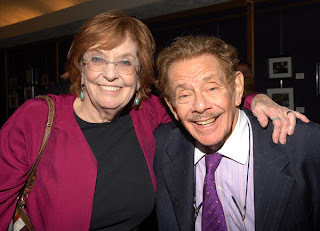 According to Anne Meara's Wikipedia entry, "Meara was raised Catholic in an Irish American family, and converted to Reform Judaism six years after marrying Stiller. She has long stressed that she did not convert at Stiller's request... She took the conversion seriously and studied the faith in such depth that her Jewish-born husband quipped, 'Being married to Anne has made me more Jewish.'" True, there will be many who say that Meara's conversion was in the Reform tradition and might not have included immersion in a mikvah (ritual bath). It is, however, possible that it did include immersion and should be regarded as a kosher conversion. That would mean that Ben Stiller is not a patrilineal Jew as Julie Wiener maintains. What is most interesting is that while Stiller (who is married to the non-Jewish Christine Taylor) should regard himself as a full member of the Jewish people because of his mother's conversion before his birth, he used his mother's former faith for laughs. And that is something that Anne Meara did for years in her comedy routine with Jerry Stiller. If a person has one Jewish parent, identifies and practices as a Jew then they are Jewish. Theoretically, this is a nice idea, though it runs contrary to several thousand years of law and tradition. Practically, however, it will lead to heartbreaking consequences and confusion among our great-grandchildren. Imagine a world where Orthodox Jews literally do not believe that Reform and < are not Jews because there is no way to prove matrilineal descent after many generations of intermarriage and acceptance of patrilineal lineage? This idea has the potential to destroy our unity as a people and is very dangerous. If someone is committed enough to wish to convert, they should do so according to Rabbinic law. My understanding was that at least officially on paper, even Conservative Judaism does not accept Reform conversions since there is almost never a mikvah and Conservative believe that the mitzvot are binding, even if individuals by and large break them. Since Reform believe mitzvot are optional there is no acceptance of the yoke of mitzvot, which the C movement at least in theory believes is required for a conversion. From my experience as a kid at a C synagogue, kids who had mothers that were R converts where told a few weeks before their bar/bat mitzvah that they "weren't technically Jewish" (never told they weren't Jewish) and a had a quick pro forma conversion. This quick conversion was viewed as just another step in the bar/bat mitzvah prep process, like buying a new suit, a pink tallit, sometimes (but rarely) tefilin, booking a treif caterer, a band for Shabbat, etc..
Who cares religion is voodoo like bulls**t. End of. Grow up. Frankly, I agree with you! I have firsthand knowledge of the conversion do Judaism and Christianity, and Judaism's acceptance is tantamount to obtaining admission to an exclusive nightclub. While many people, such as Anne Meara, are covered under 7 of the Noahide laws... It amounts to a mere "affinity for the Jewish people" rather than being acknowledged a full-fledged member of the tribe (despite living according to the Torah and performing more Mitzvah than some born of matralinial descent). I think it's time to quit the ridiculous "blocks" on Converts and allow them to do so as long as they truly are committed to living the entire Jewish lifestyle and observing all Commandments, thus observing all holidays and performing all Mitzvah. While I know the "block" is in place to test the mettle of the Convert, to see if they truly are committed to taking on the heaviness that surrounds being bound to every single facet of Law observance. Their lifestyle will declare one way or the other, and the ultimate judge in the matter is G-d. Shouldn't He be the one to decide if they're worthy to make the cut or not? In other words, we do not know who is more beloved in the eyes of G-d.
Jewish tradition it says we can't judge someone "unless we've arrived in his or her place." And since we can never be in exactly the same place and life circumstance as another person, we are never allowed to judge anyone. Therefore, judging the sincerity of the willingness to live a life according to Jewish standards is not one that any Rabbi is qualified to make. Reform, Conservative or Orthodox - it doesn't matter. It's ultimately between the Convert and G-d. Will the Beit Din's "opinions" matter to G-d at judgment? No. So I think it's time to reform the way Convert's are accepted into the Jewish nation and abolish much of the cultural politics that go with it. He helps candidates that would cut Israel in half and create another jihadi state on Israel's border. If Judaism is a faith, not a race, then why would it matter what faith either of the parents are? But if its thousands of years of tradition and law as someone mentioned, then its a race and no one would be able to convert to Judaism.